In today’s technology world, a front-end developer should be tech-savvy and proficient to translate the client needs into the creative & interactive web applications. Now, most of the top MNC companies are looking to hire for front-end developer positions to build elegant, convenient, responsive & interactive interfaces over many devices. In general, most of the candidates get confused about which type of interview questions they have to prepare for a front-end development interview. It is quite simple to discover various practice questions, but it is hard to choose the right ones amongst them. Knowing the right questions is imperative for everyone to crack the front-end developer job interview. Whether you are a beginner or an experienced candidate, review our list of top Front-End Developer interview questions and answers. This article will help you to get inspired and prepared, so you will get succeed in your interview. Let’s see what are the important front-end developer interview questions needs to prepare. 1. What are the technical and additional skills that are needed to be a front-end developer? Apart from the above mentioned technical skills, a front-end developer should have the below mentioned “good-to-have” skills. Experience in any of the Content Management Systems (CMS) like WordPress, Drupal, and Joomla. Knowledge about OOPS and PHP. Basic knowledge about SEO & tools like Dreamweaver and Flash which are utilized to present web-based information to end users. 2. Explain how you would ensure that your web design is user-friendly and what kinds of steps would you use? A front-end developer needs to talk about working alongside UX(User Experience) designers to imagine and conceptualize a web page that cultivates a user-centric experience, testing the website with users to ensure optimal design and assuring the web page is optimized for mobile phone viewing. 4. Explain what is clear? A clear is utilized when you don’t need an element to wrap around another element, such as a float. 5. Can you tell us when would you utilize CSS float? Float is utilized when you need to make an element of your web page be pushed to the right or left and make other elements cover around it. 6. What is a callback function? A callback function is utilized to limit this from happening because it is not called until the previous line of code has thoroughly executed. 7. How do you structure your source code to make it easy for leverage by your colleagues? A front-end developer needs to discuss their use of code organization and commenting. They need to explain how they use notes in their programming process to explain the steps they have taken, ensuring an efficiency of understanding amongst collaborators. 8. Explain what is the difference between Class and Prototypal inheritance? 9. Can you explain the difference between visibility:hidden; and display:none? Visibility:Hidden; – It is not visible but gets up it’s original space. Display:None; – It is hidden and takes no space. 10. Explain what is the difference between a host object and a native object? Host Objects – are objects supplied by a particular environment. 11. What is the difference between XHTML and HTML? HTML and XHTML are both markup languages in which web pages are written. The main difference between the two is that HTML syntax is SGML based while XHTML syntax is XML based. CoffeeScript has a lot of lightweight add-ons like Ruby string Interpolation and Python style list comprehension. 14. Explain what are the difference between Get and Post? A GET request is generally used for things like AJAX calls to an API, whereas a POST request is typically utilized to store data in a database or submit data through a form. GET requests are limited secure and can be viewed by the user in the URL, whereas POST requests are used in two steps and are not seen by the user. So, POST requests are more secure. 15. Can you tell us when would you utilize CSS clear? When I want an element on the left or right of the floating element not to wrap around it, I can utilize clear. 16. Describe what is the difference between Null and Undefined? Null is an object with no value. 17. Explain the importance of the HTML DOCTYPE? DOCTYPE is an instruction to the web browser regarding what version of the markup language the page is written. The DOCTYPE declaration need to be the pretty first thing in your HTML document, before the <html> tag. Doctype declaration points to a Document Type Definition (DTD). It provides markup language rules, so a browser can interpret the content correctly. 18. Explain the difference between cookies, session storage, and local storage? Cookies allow applications to store data in a client’s browser. Session storage property allows applications to store data until the window is closed. Local storage property lets applications to store data without an end. 19. Describe what is a Thread-Local object in Python Flask? A thread-local object is an object that is stored in a dedicated structure, attached to the current thread id. Flask utilizes thread local objects internally so that user don’t have to pass objects around from function to function within a request to stay threadsafe. Besides, Thread local storage performs your logger’s context global but only within the current thread. This approach is helpful, but it needs a valid request context for dependency injection or when attempting to reuse code which utilizes a value pegged to the request. 20. Explain the syntax and how to use a Function as A Class? 21. Explain what is lazy loading? Lazy loading is a design pattern generally utilized in computer programming to delay initialization of an object until the period at which it is required. It can contribute to performance in the program’s operation if correctly and properly utilized. Besides, it is a loading code only once the user needs it. For instance, there is a button on the page, which reveals a different layout once the user pressed it. Hence, there is no necessary to load code for that layout on initial page load. 22. Explain the difference between classes and IDs? Classes and ID selectors, both are utilized as hooks for CSS styles. The ID’s are commonly used to style elements that only look once on a page, such as one instance of a navigational menu. The Classes are utilized to style different elements in the same fashion, such as the presence of links. 24. Explain what is Event Delegation? Event delegation points to the process of using event propagation to handle events at a higher level in the DOM than the element on which the event originated. It enables you to avoid adding event listeners to particular nodes; instead, you can add a single event listener to a parent element. 25. How can you increase page performance? I can increase the page performance by the following methods. Clean up the HTML document. Sprites, compressed images, smaller images. 27. What is the difference between Block, Inline, Inline-block, and Box-sizing? Inline is the default. For example: An inline element is <span>. Block shows as a block element, such as <div> or <p>. Inline-block shows an element as an inline-level block container. Box-sizing displays the browser sizing properties. 28. What is Event Bubbling? Event bubbling is a type of event propagation where the event first triggers on the deepest target element. It causes all events in the child nodes to be automatically passed to its parent nodes. The advantage of this method is speed because the code only requires to traverse the DOM tree once. 29. Explain what is a Closure? A closure is a sequence of a function bundled together with references to its enclosing state. It gives you access to an outer function’s scope from an inner function. When a function renders a function, that is when the concept of closures becomes more consistent. The rendered function has access to variables that are not in the global scope, but they individually exist in its closure. 30. Explain how do you deal with browser-specific style incompatibility? There are multiple ways to operate about this. According, the simple way to proceed would be to utilize a conditional statement in the head tag of your HTML. In this way, you can recognize the browser and load an external stylesheet. 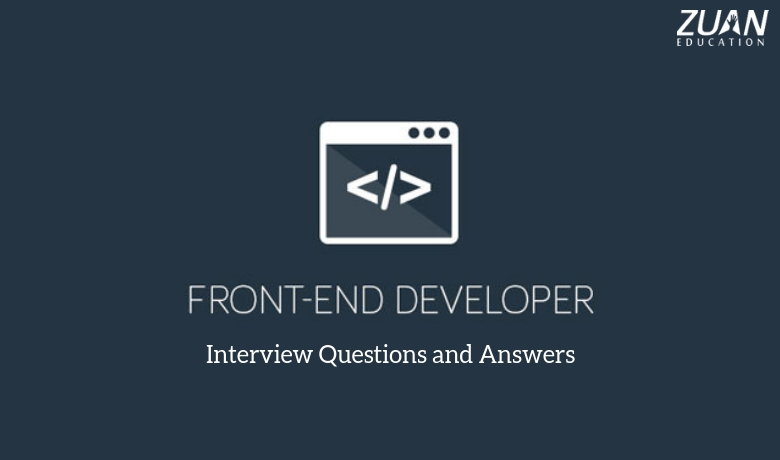 Hence, these are the most important front-end developer interview questions and answers. It will assist you with your just-in-time preparation for that job interview in front-end development. If we have missed any other important front-end developer questions, let me know in the comments. Visit this amazing site to understand. Thank you for sharing this question..These are very helpful..